Selgiene Ultra cleans and sanitises frequently touched items such as door handles, tables, banisters etc. Independently proven to kill the HIV, Hepatitis C and H1N1 Influenza viruses. Also certified to kill Clostridium difficile, MRSA and common food poisoning bacteria including Salmonella typhimurium, Listeria monocytogenes and Escherichia coli. 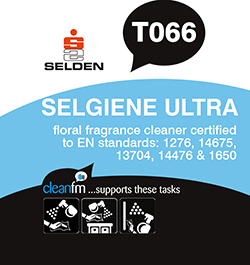 Selgiene Ultra is an essential everyday product in the fight against cross infection. It is particularly suitable for use in the care sector. Also ideal for use in all public places including schools, sports facilities, gym equipment, hotel washrooms, animal handling etc. Selgiene Ultra is bleach free and safe to use on all common water washable surfaces.